If you’re part of our staff team, do not panic, you’ll be emailed your kit list in the next month or so. •	How heavy will my bag be? Will it be easier to carry it on my back or drag it on wheels? 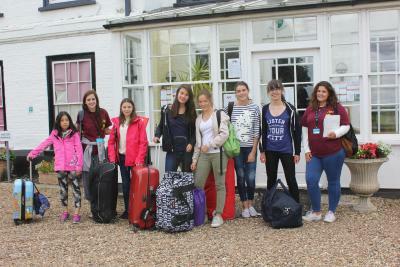 Remember you will need to get your bag to your dormitory! •	Do I want to unpack completely? If so, would a bag that’s squashable be better to fit under your bed in your dorm? •	Do you want to put your stuff in packing cubes that stack into a rucksack or have everything neatly folded or rolled in a suitcase? Whatever bag you do decide on bringing, you certainly won’t be the only one. A named water bottle – hopefully the sun will be shining throughout the summer and you’ll need to stay hydrated. A named water bottle is perfect as they are reusable – let’s save the planet and vouch to use less plastic cups this summer! A water proof coat – unfortunately, it does rain in the UK from time to time! We will only cancel outdoor activities if the weather becomes a risk, so to avoid getting wet have a good waterproof coat with you. There’s also nothing worse than being on one of our whole camp trips wandering around a city feeling like a drowned rat so you might want to bring an umbrella too. Essential clothing & equipment specific to your camp – you’ll see on the kit list for the camp you’re attending that there are some specific items you must have. At XUK Activity, long sleeves tshirts, long jeans or tracksuit bottoms and old trainers/water shoes are essential for some activities. All of our campers at XUK English are required to bring an equipped pencil case to their English lessons. And each elective at XUK Excel requires different items of clothing and equipment. You might be wondering how much of each item to bring. That very much depends on how long you are coming for, how much space you have and how often you plan to use our weekly laundry service. Remember to leave space for souvenirs and mechanise you might buy during your stay. •	How often do I plan to change my outfit each day? •	Do you plan to do lost of sports where you might get sweaty? •	Are you booked onto Water & Forest Adventure at XUK Excel where your clothes are very likely to get wet and muddy each day? Before you put anything into your bag, grab a permanent marker pen or name labels and label EVERYTHING. LITERALLY EVERYTHING. With over 100 campers every week at each of our camps, we end up with a lot of lost property at the end of each summer, however, if we find an item of clothing and it has your name in it, we can easily get it back to you during your stay. It also helps with handing laundry back to you each week. Depending on your age, you might need a bit of help packing for your stay. We recommend that you try and do as much as you can independently as you’ll need to pack all your belongings back into your back at the end of your time at XUK Camps. Some campers like to pack items into bags or packing capsules, for example all their t-shirts into one bag. Whereas others like to put outfits together, so they are very accessible each day. We would recommend putting your pyjamas at the top of your bag so they are ready for your first night. When you arrive at camp, you will need to hand in your documents (passports, plane tickets etc.) and medication so it is very useful to carry these in your hand luggage to avoid having to go through your suitcase when you arrive. If you are coming from overseas we also recommend carrying your booking confirmation and a permission letter from your parents to travel to the UK to avoid any issues at immigration. If you have any questions about packing – campers and staff team, get in touch between us in the office, we have packed for camp more than 50 times!